The psychical humor, foul language, and overall raunchiness in the trailer is only a tiny portion of what we will see in the film. But it doesn’t make it any less funny. Helms seems to have captured the spirit of Clark Griswold, who was just as naive in the previous Vacation films. Speaking of which, Chevy Chase and Beverly D’Angelo appear in the reboot as Clark and Ellen Griswold. Leslie Mann stars as Rusty’s sister, Audrey (Griswold) Crandall. Keegan-Michael Key (Key and Peele) and Regina Hall (Scary Movie 1-4) will play neighbor friends. 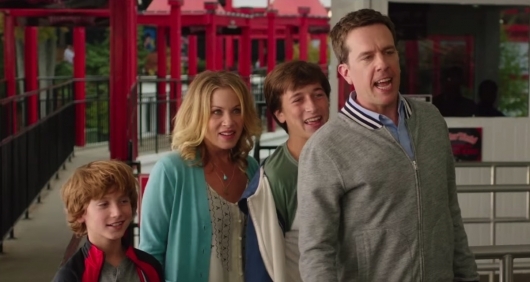 The idea that Chris Hemsworth is branching out into comedy with Vacation is great. Based on previous trailers and stints as SNL, he doesn’t seem like he is out of place, plus he has a part in Paul Feig’s Ghostbusters reboot. Directed by John Francis Daley and Jonathan Goldstein, Vacation arrives in theaters next Wednesday, July 29th.